A comparison of the lithological–geochemical parameters for the deposits of the Dalnetaiga series of the Bodaibo synclinorium (the Buzhuikhta and Khomolkho formations) and the Olokit structural-formational zone (the Itykit and Ondok formations), hosting polymetallic deposits (Kholodnin, Ioko-Rybach’e), along with the obtained geochronological LA-ICP-MS U–Pb age estimates of the Ondok Formation (~600 Ma), indicates their similar stratigraphic position in the Neoproterozoic in Southern Siberia. 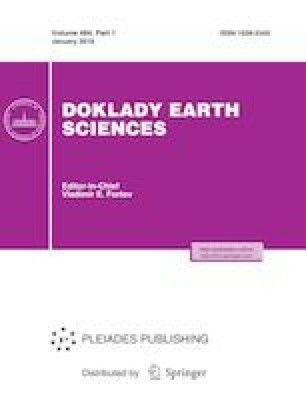 At the first stage of formation of polymetallic and gold-ore objects, the siderochalcophylic trend is considered to have appeared synchronously in the two structural zones, which could have been caused by the hydrothermal activity in the back-arc basin of the Olokit structure. This work was carried out under state assignment Project IX.130.3.1. (0350-2016-0032) and was supported by the Russian Foundation for Basic Research (project no. 18-05-00081).